It feels like ages since my last blog post guys, I’ve been suffering from a really awkward Root Canal for the past few months and after being out £400+ I ended up having to get the blinking tooth removed anyway! Total Nightmare. Anyway, I’ve not been in a particularly ‘bloggy’ mood lately as I have been food and sleep deprived not to mention in excruciating pain. However the good news is that even though I have slightly swollen face, the tooth is gone and I’m on the road to recovery… finally. 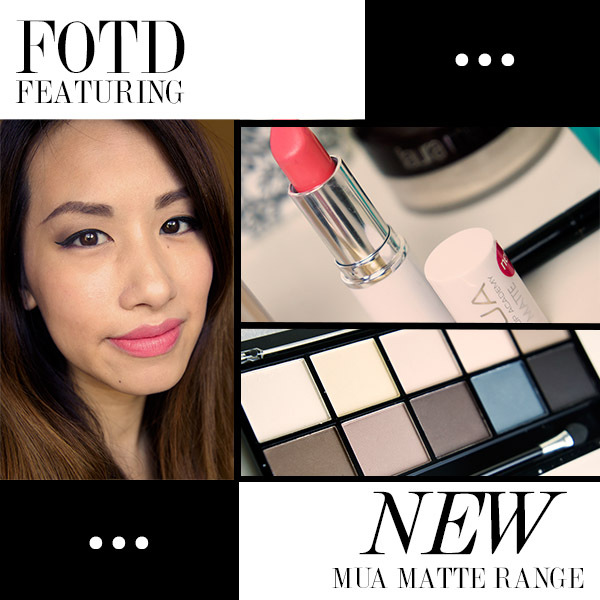 I thought I’d do a quick FOTD post to get myself back into the swing of things especially since I’ve just purchased some really exciting new products from MUA. During a shopping trip I picked up three MUA items including the MUA Matte Palette, the MUA Matte Lipstick in Peachy Keen and the PRO BASE Conceal and Brighten Kit. I’ve been looking for a complete, matte eyeshadow palette and did toy with the idea of forking out £20 for the UD Naked Basics, but I am so chuffed to have found a budget version for just £4! So my FOTD Today is pretty much a look I’ve been wearing religiously everyday, I’m going through a neutral, smokey eye phase at the moment and love how it gives my otherwise, very flat eyeshape some needed depth and definition. I am also paying more attention to my eyebrows, grooming and what not! I’ve been banging on about the SKINFOOD Eyebrow pencil for a while, but Today I wanted to give a special mention to my new best friend the SLEEK Eyebrow Kit! My search for an affordable palette of wearable nudes and mattes was over as soon as I landed this gorgeous MUA Matte Palette! At just £4 this was a right steal for 10 stunning shades. I kid you not when I say that I’ve been using it everyday, I love how versatile this palette is. It’s got the perfect combination of nudes, darks and highlight shades meaning you can go as subtle or as dramatic as you like. My favourite shades include Fade (Top row, last pan) and Chino (Bottom row, second pan), both neutral and creamy taupes that reminds me of Urban Decay’s ‘Faint’ Eyeshadow. The pigmentation of this palette is so so, but is definitely workable and can be built up especially when used with a primer first. For some weird reason, the shades don’t swatch very well on my hand but it works just fine on my eyes? I find two layers of each colour was enough to brighten up my eyes. I like to sweep Fade across the entire lid area and Chino along the socket to add depth before finishing with Truffle (Bottom row, third pan) on the outer corners of my eyes to create a smokey effect. I then dip a small brush into Truffle and line my lower lashes to tie it all up. For £4 I think this palette is well worth the money and should definitely be considered as your next everyday palette purchase. It’s so versatile since it can be used for day and night looks, some shades like Penny (Bottom Row, First Pan) can also double as either contour shades or even eyebrow powders. Whilst this lippie isn’t one of MUA’s finest, it’s not a bad one for just £1, plus when a lipstick is cheaper than your chips can you really complain? I got my fair share of MUA Lipsticks and have loved the pigmentation and formula of each one. The Matte range is new and since I am loving anything matte these days, I was excited to try these out. I got three shades but Today I am wearing Peachy Keen – a Coral Orange shade with pinkish tones. This one is definitely a very close match for the Ilamasqua Lipstick in Over in terms of colour so if you after a good budget dupe this is your winner ladies! Pigmentation and formula wise, this isn’t as impressive as MUA’s standard lipsticks as I found I needed to really work it in to get a decent application. It applies matte but also a little like a stain which I actually quite like. Be warned though, if your lips tend to be on the dry side then I recommend that you exfoliate and moisturise first as this lipstick will bring up unsightly flakes. However all in all, I love the colour which lasts a good few hours as it stains the lips, the formula isn’t the best but as I say, it’s £1, we’re not asking for too much really. I LOVE this palette! The Pro- Base Conceal & Brighten Kit is a three part concealer kit that is fantastic for covering scars, blemishes, redness, dark circles and for highlighting the face too. I use mine mostly for hiding my signs of sleepless nights and also some scarring on my face from previous pimples, I find the creamy formula a joy to work with. It blends seamlessy into my skin and gives my complexion the perfect pick me up I need, brightening under the eyes and helping me define my lips after my lipstick. A great a little find that now forms part of my essential makeup kit along with the MUA Matte Palette. The palette contains two concealers a light and a dark, perfect for mixing or using their own. It also contains a pink highlighter shade that goes on sheer and just leaves a nice sheen on the skin. The highlight looks fab when used in the corners of the eyes or on the cupids bow. It does wonders for a brightening and illuminating effect. I actually think it works just as well as my YSL Touche Eclat and it’s a great alternative if you are on a tight budget. OK, so this isn’t actually a palette owned by myself, I may have borrowed (stole) it from my little sister and I’ve become rather attached to it! I love how defined my brows look with this kit, something that I can not achieve with my other eyebrow fave – the SKINFOOD eyebrow pencil. The Sleek Eyebrow Kit contains a wax which is great for shaping your brows and keeping the hairs in place. An angled brush is provided with the kit but I prefer to use my Mac 266 for better control. Then to set the brows the kit is also equipped with a setting powder, I find this is really good to help blend out any harsh lines and gives a very natural and well groomed finish. Have you got a favoured look you’ve been wearing lately? Would love to see your fave looks, just link me up in the comments below, I’ll definitely check them out. Tags: FOTD, Make up academy, Matte Eyeshadow, Matte lips, Mua, MUA PRO Base, Sleek Cosmetics. Bookmark the permalink. I love your eyes here. And that lipstick color. I also have the conceal and highlight kit but I don’t think i really use it, now i’ll probably give it a try!